Okay, there are only eight Mario Kart games to begin with, at least if you don’t count the arcade versions. But with the release of Mario Kart 8 for the Wii U, it’s time to take a look back at the series’ 22 year history. For a game that seems static and stalwart, Mario Kart has endured a tremendous amount of change over the years—transitioning from 2D to 3D, suffering through the addition and removal of fan favorite characters, and even the introduction of motion controls. Some of those games suffered more than others, though, and after countless laps and heartbreaking last minute losses, this is my best reckoning of which Mario Karts get a checkered flag, and which ones get left in the dust. It makes a lot of sense that a Mario Kart made for the Wii—a console that captured the casual gamer like few before—would be the series’s most egalitarian. 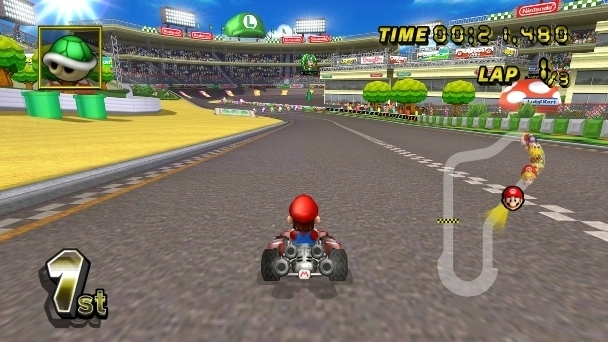 Mario Kart Wii tries to add fairness by dropping first-place-punishing power-ups more frequently than ever before and offering players who don’t want to master the game’s drifting controls an “automatic” option so they can wiggle the Wii’s motion-controls worry-free. While these changes literally paid off for Nintendo—Mario Kart Wii is the best-selling entry by a Moo-Moo Meadows mile, having sold over 35 million copies—all I can remember is offering a lot of deflated, apologetic shrugs while auto-drifting past a friend who got blue-shelled three times in a single lap. I didn’t realize how much apathy I have for Mario Kart 7 until I had to rank it in a list! I don’t really have a bad word for it, but all the words I’ve got—stalwart! mandatory! perfectly serviceable!—feel like some pretty faint praise. Mario Kart 7 for the 3DS is a “must-buy” in the same way that every portable Mario Kart is, but I don’t know that gliding and underwater driving did much to enhance the experience. It’s a good game, just not one that inspires as much excitement as the rest of the games on this list. 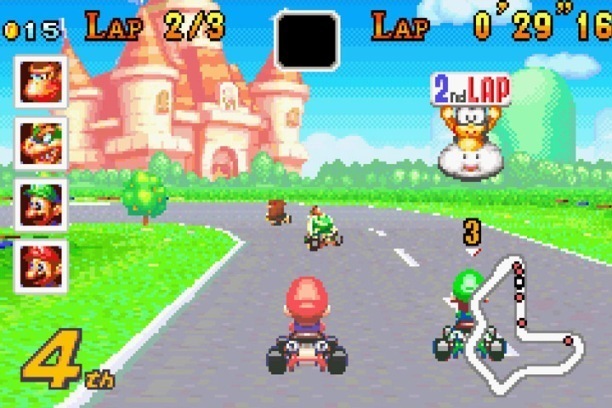 Mario Kart’s middle child, Mario Kart: Super Circuit hit stores years after the Nintendo 64 version on a system that (reasonably) couldn’t come close to producing similarly massive-feeling, three-dimensional tracks. Instead of trying, Super Circuit takes the much smarter route of styling itself off the original Super Mario Kart, taking those flat, Mode 7 powered courses, smoothing their rough turns and dropping in much prettier characters. It was a great game given the limitations of the Game Boy Advance but, sadly, Mario Kart had moved on. It took 6 years for Mario Kart to sort itself out after the shaky play of the Wii version, but Mario Kart 8 (so far) feels like it’s on an even footing. The weapons are re-balanced, the game is stunning in HD for the first time ever, and the courses’ twists and turns literally defy gravity. Mario Kart 8 is marred only by a neutered Battle Mode and a few other notable bumps in the road, but it’s a great Mario Kart to its core. Now we’re into the real greatness, a selection of games that so defined different eras of my life that this list may as well be “Top Five Mario Kart Games With A Four-Way Tie For First”. Super Mario Kart is the granddaddy of not just all the games on this list, but a whole damn genre. Of all the games I poured time into as a kid, Super Mario Kart was the first that everyone in the house wanted to play—if it was on, everyone was in the living room, despite only two people being able to play at once. Super Mario Kart shaped what playing games together looked like for the next 20 years, and only falls so low on this list because of the greatness of the games that came after. This is the one that changed it all. 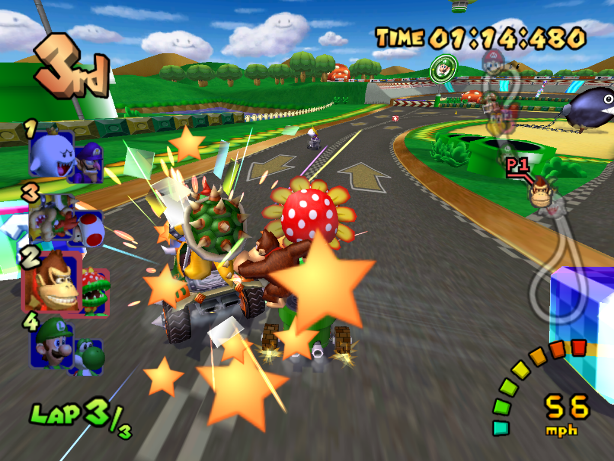 Mario Kart 64 introduced 3D tracks, four-player multiplayer and redefined the roster of power-ups. Not only did players get to equip a ring of shells for the first time—letting you roll three red or green shells deep at once—but this was the first appearance of the now iconic blue shell. The courses themselves were so massive, so much bigger than Super Mario Kart’s courses, that the number of laps in a race had to be cut down from 5 to 3. 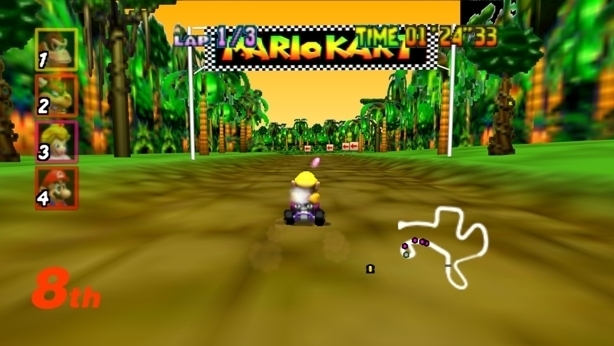 Like most games on the Nintendo 64, Mario Kart 64 took a beloved game into the 3D age, avoiding disaster and defining the direction of the series for close to two decades. 2. Mario Kart: Double Dash? I find it funny that Mario Kart: Double Dash!! 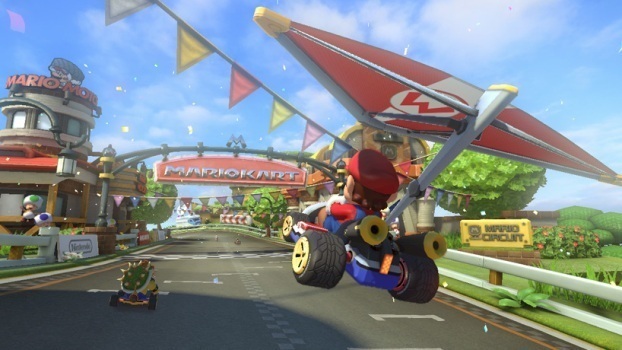 is so divisive—of course the game that adds a second driver to each kart would split its audience in two. I loved this aspect of Double Dash! !—carrying multiple items by swapping back and forth between your two drivers, picking just the right combination of heavy/medium/light drivers, and playing Mario Kart as cooperatively for the first time before or since added nothing but excitement for me. Double Dash!! also has some of the greatest Mario Kart courses of all time. I can’t think of Mario Kart without thinking of getting shot out of the giant volcano cannon of DK Mountain, grabbing all the shortcuts in Mushroom Bridge or trying to make sense of the absolute madness of the merciless 7-lap gladiatorial arena that is Baby Park. Mario Kart never tried any of the weird stuff Double Dash!! introduced again, which seems wise considering how many people view them as a misstep, but I loved every shell of it. Then again, there’s something to be said about simplicity. Double Dash!! is built for flash, equipped with racing stripes, flashing lights and a horn that plays “La Cucaracha”. It’s a whole lot of fun, but almost feels tacky once you see the classic elegance of Mario Kart DS. 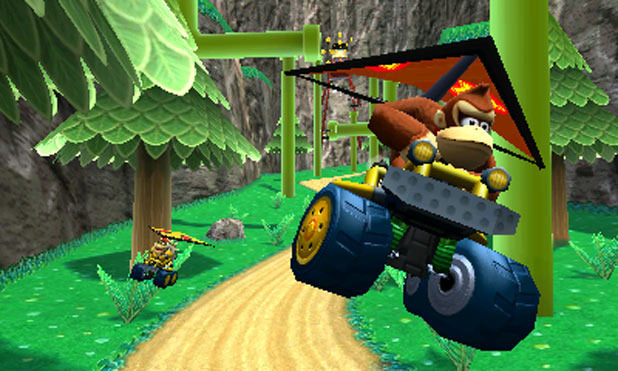 Mario Kart DS delivers the last pure kart racing and items experience in the series, before future installments started to add the arguably superfluous bikes, gliders and stunts. And while Mario Kart had been best on a couch to that point (sorry again, Super Circuit), Mario Kart DS made it so you could race against friends anywhere. Long wait in line at a convention? Try some Mario Kart. Memorial Day cookout need a little excitement? How about Mario Kart. Boring funeral? Mario Kart, but please try and be quiet about it. Online play wasn’t the only now crucial component introduced in Mario Kart DS. 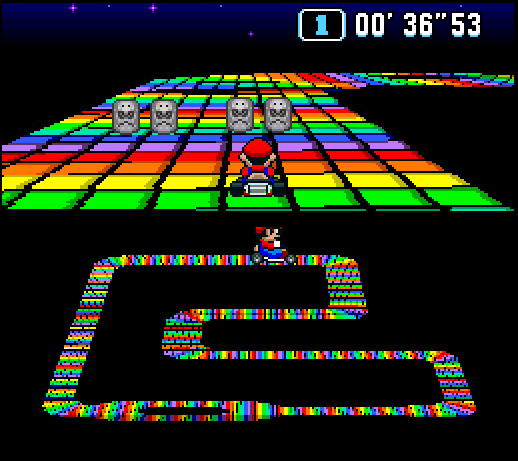 It also gave us the Retro Grand Prix. Seeing old courses return with fresh new features has turned into one of my favorite things about Mario Kart, and I have the DS version to thank for that. Even though I still have Mario Kart 7, I’ll find myself popping this game into my 3DS from time to time, just to grind out a few sparks around some of my favorite courses and remember all the time spent hearing friends yell and curse into the face of their respective DSes. Casey Malone is a game designer, comedian and freelance writer living in Boston. Follow him on Twitter @CaseyMalone.